TRENT - Dec. 7. - C.T. Beckham, retired farmer and merchant, died at his home here at 5:30 P.M. today, following a brief illness. Physicians said death resulted from paralysis of the heart, which developed Tuesday night. Mr. Beckham ahd benn ill of influenza since last Friday. The funeral service will be held Thursday afternoon at 2:30 o'clock at the Trent Baptist church, in which Mr. Beckham was a deacon. Resident of Trent for more than 25 years, Mr. Beckham was prominently identified with the growth and development of the town and communiyt. For several years he was a firm member of the Star Hardware company here. He sold his interests in the business to the Williamson brothers in 1930. Owning land near the town, he also engaged in farming and stock raising. He is survived by his wife,Julia; sons, Hubert and Winslow Beckham, both of Lamesa, and two daughters, Mrs. Geta Williamson and Mrs. C. C. Stribbling, both of Trent. A. Shepherd, Barrow Funeral HOme director at Merkel, will have charge of the funeral arrangements. LAMESA - Merrie Meadows of Berkeley, Calif., became the bride of First Lieutenant Carroll Truett (Sparky) Beckham July 3 at 8 p.m. in a ceremony in the Sanctuary of the First Congregational Church of Berkeley. The bride is the daughter of Charles W. Meadows and the late Mrs. Meadows. 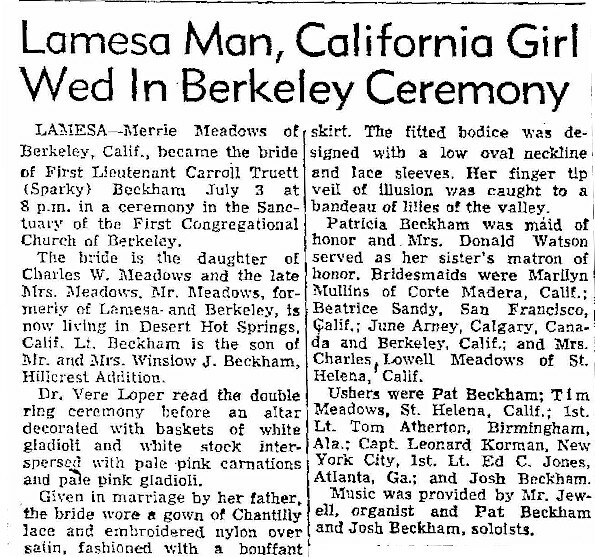 Mr. Meadows, formerly of Lamesa and Berkeley, is now living in Desert Hot Springs, Calif. Lt. Beckham is the son of Mr. and Mrs. Winslow J. Beckham, Hillcrest Addition. Dr. Vere Loper read the double ring ceremony before an altar decorated with baskets of white gladioli and white stock interspersed with pale pink carnations and pale pink gladioli. Given in marriage by her father, the bride wore a gown of Chantilly lace and embroidered nylon over satin, fashioned with a bouffant skirt. The fitted bodice was designed with a low oval neckline and lace sleeves. Her finger tip veil of illusion was caught to a bandeau of lilies of the valley. Patricia Beckham was maid of honor and Mrs. Donald Watson served as her sister's matron of honor. Bridesmaids were Marilyn Mullins of Corte Madera, Calif.; Beatrice Sandy, San Francisco, Calif.; June Arney, Calgary, Canada and Berkeley, Calif.; and Mrs. Charles Lowell Meadows of St. Helena, Calif.
Ushers were Pat Beckham; Time Meadows, St. Helena, Calif.; 1st Lt. Tom Atherton, Birmingham, Ala.; Capt. Leonard Korman, New York City, 1st Lt. Ed C. Jones, Atlanta, Ga.; and Josh Beckham. Music was provided by Mr. Jewell, organist and Pat Beckham and Josh Beckham, soloists.